The AMD Radeon HD 7600G or HD7600G is a processor graphics card in the Trinity APUs from AMD. It can be found in the ultra low voltage 19 Watt A8 versions (e.g. A8-4555M) and offers all 384 Radeon cores. However, the base and Turbo clock rate was reduced from 497/686 in the 7660G to 320/424 MHz in the 7600G. The architecture is based on the VLIW4 architecture of the Radeon HD 6900 series desktop graphics card and doesn't offer a dedicated graphics memory. Trinity got its name due to the fact that it consists out of three different architecture parts. The CPU cores are based on the Piledriver architecture (Bulldozer successor), the GPU cores on Northern Islands GPU cores (HD 6900 desktop series) and the video processing engine and multi-display connectivity from the new Southern Islands GPU architecture (HD 7900 series). The integrated UVD3 video decoder (Avivo HD) allows the full decoding of Multi-View Codec (MVC), MPEG-4 Part 2 (DivX, xVid), MPEG-4 AVC/H.264 and Adobe Flash HD videos. The performance is in the low range of HD 7500M series cards and similar to the Intel HD 4000. Combined with single channel memory, the card will perform significantly slower. The APU is still manufactured in 32nm and, as this ultra low voltage part is clasified at 19 Watt, good suited for small or ultrathin laptops. The AMD Radeon HD 7660G or HD7660G is a processor graphics card in the Trinity APUs from AMD. It is the fastest version and is featured only in the A10 series. It is based on the VLIW4 architecture of the Radeon HD 6900 desktop series and doesn't offer a dedicated graphics memory. Trinity got its name due to the fact that it consists out of three different architecture parts. The CPU cores are based on the Piledriver architecture (Bulldozer successor), the GPU cores on Northern Islands GPU cores (6900 desktop series architecture) and the video processing engine and multi-display connectivity from the new Southern Islands GPU architecture (HD 7900 series). The performance of the Radeon HD 7660G differs from the used benchmark. In synthetic benchmarks like 3DMark 11 it reaches the level of the dedicated Radeon HD 7670M. However, in games (and playable settings) the performance is more similar to the AMD Radeon HD 6630M. Therefore, the performance is significantly better than the Intel HD Graphics 4000 in the Ivy Bridge Quad-Core models. The shaders of the chip can also be used for general computing. More information and benchmarks of OpenCL and DirectCompute 11 tests can be found in our Trinity Test of the A10-4600M. 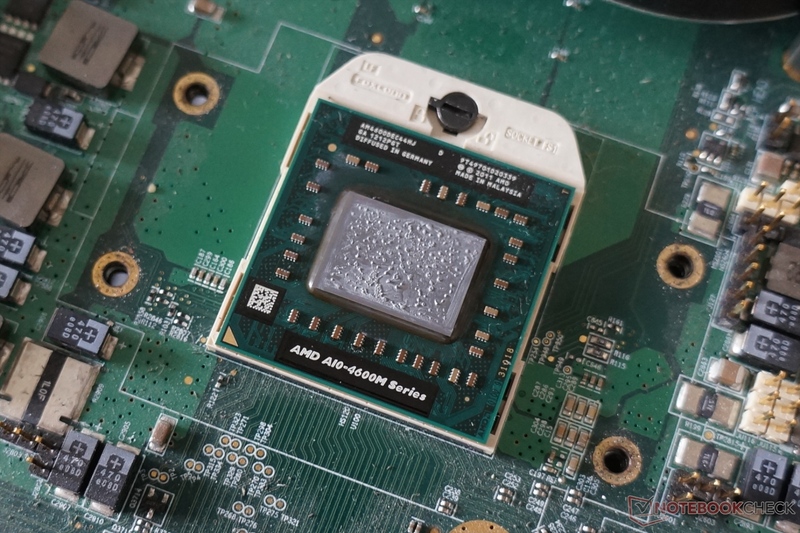 The APU is still manufactured in 32nm and as most A10 series parts should be classified with a 35 Watt TDP, the HD 7660G is best suited for laptops of 13-14-inch an up.